is one I simply have to read right away. What? Of course it's not the Eiffel Tower. Though a piece of that did get sold at auction last month. 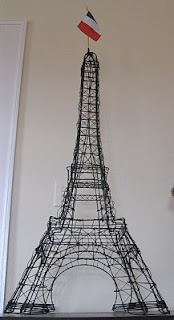 No, this Eiffel is 40 inches tall (48 including the flag), a cool wire sculpture. There just won't be room for it in the storage containers; and I'm downsizing anyway. It's funny, when I was living in Paris I didn't have Eiffel-Tower objets or posters around the apartment, because I had the real razzle-dazzle deal in my arrondissement. I'm reluctant to part with this, but practicality is outweighing sentiment this week! What price tag should I put on it? 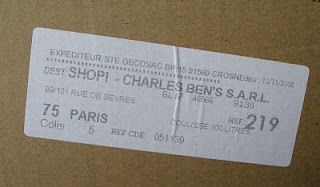 The last time I moved, in Paris, I was mostly focused on international shipping issues and the état des lieux. But we all really know that the most important part of moving any household is having enough boxes. 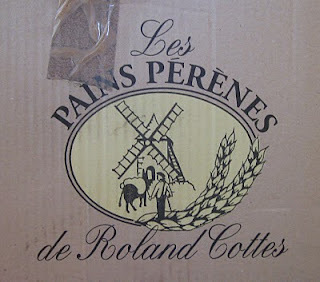 To prepare for the move in Paris I had done the regular drill: go to the neighborhood store and beg for discarded boxes. 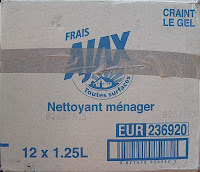 My Shopi supermarket on rue de Sevres was a boon: they kept a constant stack of cartons up front. No begging necessary! 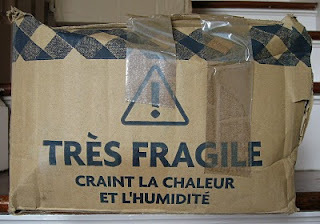 And when the shipment finally arrived in the U.S., oh, about four months later, I felt pangs of nostalgia when I saw all those French grocery-store boxes. The labels, the warnings, the descriptions on the boxes shouted "Paris!" to me. So of course I photographed them. "Fears the heat and the humidity." Sounds so poetic. Labels: city life, where am I? Joyeux Anniversaire, a la recherche du temps perdu. Today is my birthday. At least I think it is. That is, I think today is today. It all depends. Yesterday morning I received a heartfelt "Happy Birthday!" on Facebook from a friend in New Zealand. I thought she had the day wrong, but sure enough, it was already January 6 in Auckland. I double-checked here, of course, because I have a hard time wrapping my brain around the International Date Line shenanigans. Likewise, this morning I received a "belated happy birthday" wish from a friend in Tokyo. But... but... it's still my birthday where I am. So is it really my birthday? Straddling just the simple 6-hour time difference between the U.S. East Coast and Paris is challenge enough for for some folks. It can cause Parisian phones to ring in the wee hours with calls from otherwise considerate American friends who counted backwards instead of forwards. Or did they count forwards instead of backwards? Never mind. But that is why I installed the nifty clock on my blog that tells the current time in Paris. And for an added twist, there is the fact that the US and France spring forward and fall back at different times, so that for a few weeks each year there is only a 5-hour time spread. Love that Daylight Saving; keeps me on my toes. But it's nothing compared with mentally crossing the International Date Line. I once asked an Australian reader of this blog what the time difference was between Sydney and Paris. His response: "I think it's, like, 27 hours." Whoaaaaa. Take that plan into orbit. But he is not alone. Take this excerpt from the Wikipedia entry on the International Date Line. 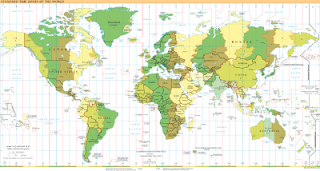 The International Date Line can cause confusion among airline travelers. The most troublesome situation usually occurs with short journeys from west to east. To travel from Tonga to Samoa by air, for example, takes approximately two hours but involves crossing the International Date Line, causing passengers to arrive the day before they left. Whenever I try to keep the east-to-west, west-to-east notion straight, in my mind's eye I picture the globe slowly spinning at the opening of "As the World Turns." I'm not sure this is a help. The show just got cancelled. Baby, it's cold outside! And the 3-bedroom farmhouse that I am renting in Virginia had a teensy little problem while I was away over Christmas. The furnace broke, and I won't bore you with the mechanical details but they're not pretty. Suffice it to say that I now find myself residing in the local Holiday Inn until the sweet adorable charming intelligent handsome heating contractors find the right part for the burner and restore toasty warmth to my below-freezing abode. Reflecting on my 5 days of hotel-dwelling, I realized how Paris apartment living prepared me for this. 1. Space. Living in 26 square meters is No Big Deal. Granted, my Paris apartment was larger. But having lived in a relatively small space for years, this is almost second nature. I can pace around in my hotel room, talk on the phone, use the internet, and watch TV without getting antsy. Then I can exit quickly to forage for acceptable take-out food, do errands. Tres parisien. 2. Noisy neighbors. Ah, it's just like the good old times in Paris, where I knew exactly what my neighbors were up to. And when I cross paths with them in the hallway, being all grown-up, pretending not to acknowledge anything that I heard last night. 3. Hearing French on TV. Okay, this is a stretch. I'm watching HGTV on location in New Orleans and they are saying "parterre" "looks like Versaille" and "ooh la la magnifique." My ears perk up when I hear the TV host saying (no joke) "Polly-vous francais?" No, of course he wasn't referring to me -- he was attempting to speak French. Of course HGTV isn't quite the same caliber as Le Grand Journal. Or as much fun as those French home TV shows such as Recherche Apppartement ou Maison or C'est du Propre! 4. Riding the elevator. Yes, just like in Paris, I'm on the third floor and take the elevator to the lobby. Just like Paris, there is a lady on the ground floor who greets me and observes my comings and goings. The difference is that the hotel elevator is the size of some Parisian studettes. 5. Storage. A little closet with 8 hangers. Four bureau drawers. Just like Paris apartment living! But there are significant differences between all-American Holiday Inn and living in a Parisian apartment. Unlike Parisian plumbing, the hotel shower is a dream. I could live in this shower. And then, there's the ... the... the... hotel coffee. At least they claim it's coffee. Labels: city life, made me laugh, travel, where am I?